Home > Learn More > Treatment Areas > Back Pain > Poor Posture is called Upper Cross Syndrome! Your posture plays an important role in your overall health. Poor posture leads to chronic strain and discomfort. 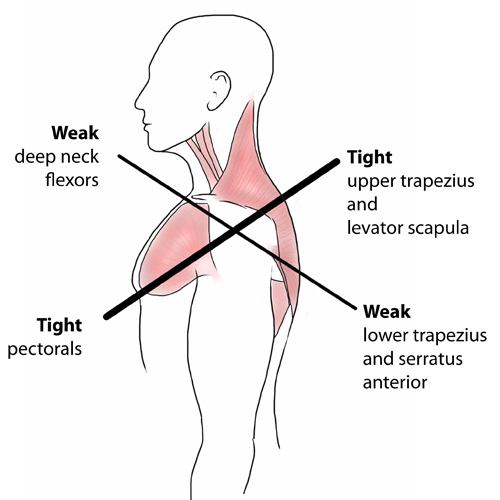 “Upper cross syndrome” describes poor posture that results from excessive tightness in your shoulders and chest with weakness in your neck and mid-back. This combination forces your shoulders to roll inward and your head to project forward. To help understand how upper cross syndrome causes trouble, think of your spine as a telephone pole and your head as a bowling ball that sits on top. When the bowling ball is positioned directly over the top of the upright post, very little effort is required to keep it in place. If you tip the post forward and the ball begins to roll over the edge of the post, significantly more effort would be required from the muscles trying to hold it there. This effort results in chronic strain of the muscles of your neck and upper back. The chronic strain is uncomfortable and may also lead to neck pain, upper back pain, headaches, TMJ pain, and ultimately- arthritis. 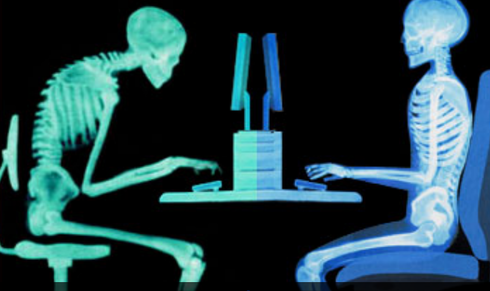 This postural problem is exceptionally common in computer workstation users. Correction of this problem is accomplished by freeing up stiffened neck and back joints, stretching the tight muscles, strengthening weak muscles, and modifying your workstation. The best way of measuring improvement of Upper Cross Syndrome is improvement in your Posture Number. If you’re suffering from the ill effects of poor posture and Upper Cross Syndrome, seek immediate treatment with our team of professionals at Mind & Body Chiropractor today.